In the news lately, Popocatepetl located just southeast of Mexico City, is erupting. 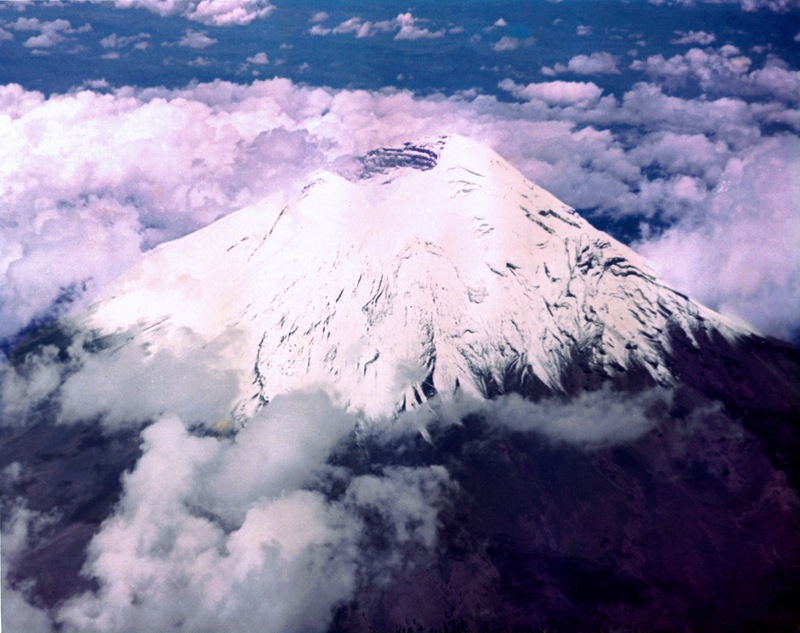 I took this picture of a dormant Popocatepetl from an airliner window in 1973, as I returned from a cooperative study trip to Costa Rica. I bet the snow now is almost gone, if not entirely. It’s an amazing shot though, lucky you for being able to shoot from an aircraft! You get vantage points that can technically barely be reproduced, that’s really cool. What did you study? Thank you for your comments. You are right, the airplane made a difference although the window glass gave the upper cloud a pink tinge. Photo journalism was a part of my job description at the time. I knew I had a good shot. I learned early that angle makes a difference. I worked for a rural electric cooperative. The people of rural America wanted the benefits of electricity at their farms and homes. They used consumer cooperatives to accomplish this during the 1930s and 1940s. The use and demand for electricity soon outgrew the capacity of the original equipment. Thirty years later most of the nation’s electric cooperatives found that the original equipment had to be replaced. The outmoded equipment such as transformers, small wire and insulators were scrapped. A group of cooperatives from Arkansas started a movement to send the material to Costa Rica so that small villages and rural areas there could have the benefit of electricity, too. Other coops in the nation joined in the effort. I was with a group invited to Costa Rico for a five day tour to observe what they were doing with the used equipment. It was in fact a business trip. To a young guy with two 35mm cameras hanging around his neck, it was a trip to remember, along the Sundown Trail. Thanks for asking. Wow, that sounds awesome. I hope they did what you’d hoped for, out there in Costa Rica, with all that equipment. What a beautiful country, a friend of mine went and showed me pictures. I was very jealous! 🙂 Thanks for the thorough reply! !